Yay! The weekend is here! For me that means lots of time with my wild maniac 3 & 5 year old boys. Birthday parties, ice skating, trains, etc. etc. So you know something that’s really hard during December? Holiday guests. They come, they mess up your house, you have no access to your bathroom or the food you want to eat. 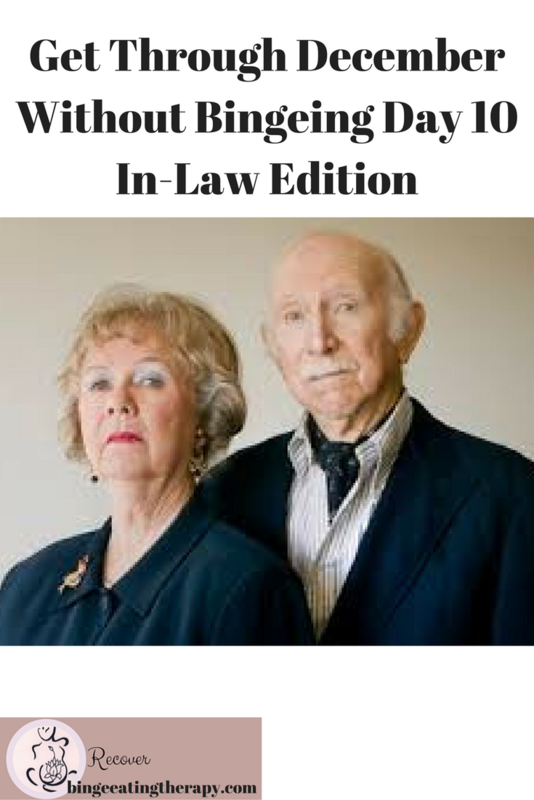 Especially if said guests are… oh I don’t know– YOUR INLAWS maybe? Don’t be in your house. When your family or your partner’s family is in town — it’s best to be out as much as you can. Being in can be stifling and make you restless and trigger a binge. Make lots of plans to get out and take your guests places, see the sites and enjoy your time with them without being stuck in your house with the food, with the booze, with the TV. Plan things ahead of time and if they have other things they want to do, great. But make sure to get out. And if you can have your guests leave so you have time to be alone in the house and clean and get situated, even better. Oh I’m sure you love your guests, but it’s always difficult to have a change in routine, so planning for it is wise. I can really relate to this quote because I have the same exact experience. Every accomplishment that I’ve made has been terrifying for me and I’ve wanted to give up. I feared failure and ridicule. And both those things are hard, but not as hard as regret. I don’t regret the things I worked hard for and at, just the things I never did. Really, I don’t mean to complain but it is COLD here in California. So cold that I have to wear my warmest hoodie. Lol– when I had just moved here, I remember the first Winter hearing on the radio that it was a COLD day in the Bay so to remember to get your warmest hoodie. I grew up in New York City and had been living in Boston so when I heard “cold day” and “warmest hoodie” I burst out laughing. Anyway, I hope that you are enjoying the Get Through December without bingeing series. IT’S SATURDAY – YAY! I hope you’re having a great weekend. We are having our annual latke open house today and I’m super excited/nervous. We opened our home to about 100 people and we have a small little house– wish me luck! Mindfulness. We tend to think of mindfulness as spending 20 minutes a day sitting in half lotus with our eyes closed trying to either stop our thoughts or notice them without attachment. Meditation is great! But it’s not mindfulness. It’s like the homework that you do to help your mindfulness practice and to access your inner peace. But what mindfulness practice really encompasses is a whole-hearted approach to your daily life, not 20 minutes a day of meditation. It’s about noticing your thoughts, feelings and the way you react to them. Louis Ormont came up with the psychological theory of the observing ego. The observing ego is the part of you that watches your behaviors, thoughts, actions, and reactions without judgment or attachment, just curiosity. This is where Eastern Philosophy and American Psychology overlap. Calling on your observing ego is a way to institute mindfulness when you are feeling overwhelmed. Here’s how to do it. Imagine just pulling yourself out of yourself for a moment and watching yourself like a movie. You are standing outside of yourself and just observing. Example: You are at a party and you notice that you have the urge to run to the buffet to eat. You then pull yourself out of yourself and just watch like an impartial viewer. I am feeling really anxious here– there are a lot of people and I don’t know what to say. I am afraid that people are judging me. I am afraid of what that they think about the way I look. I am afraid to talk for fear of sounding unintelligent. I want to eat so that I don’t feel this way. That’s very interesting to see my feelings and watch how I want to react to it. So what you are doing in a sense is disconnecting yourself from the intensity of the feelings and the urges and watching yourself with kindness, curiosity and impartiality. This is a mindfulness practice that can help you to not get so bogged down in feelings and help you to just be despite what impulses your brain might be sending to you. Try it out next time you find yourself in a situation that is anxiety provoking. Elegance lies not in the clothes we wear, but in the way we wear them. It isn’t in the way we wield a sword, but in the dialogue we hold that could avoid a war. Elegance is achieved when, having discarded all superfluous things, we discover simplicity and concentration; the simpler the pose, the better; the more sober, the more beautiful. And what is simplicity? It is the coming together of the true values of life. Snow is pretty because it has only one colour. The sea is pretty because it appears to be a flat plane. The desert is beautiful because it seems to consist only of sand and rocks. The simplest things in life are the most extraordinary. Let them reveal themselves. I’m happy you’re still reading my daily series on how to get through December without bingeing. What a week! So happy it’s Friday! We are getting knee deep into holiday parties so remember to keep coming here for tips and inspiration. 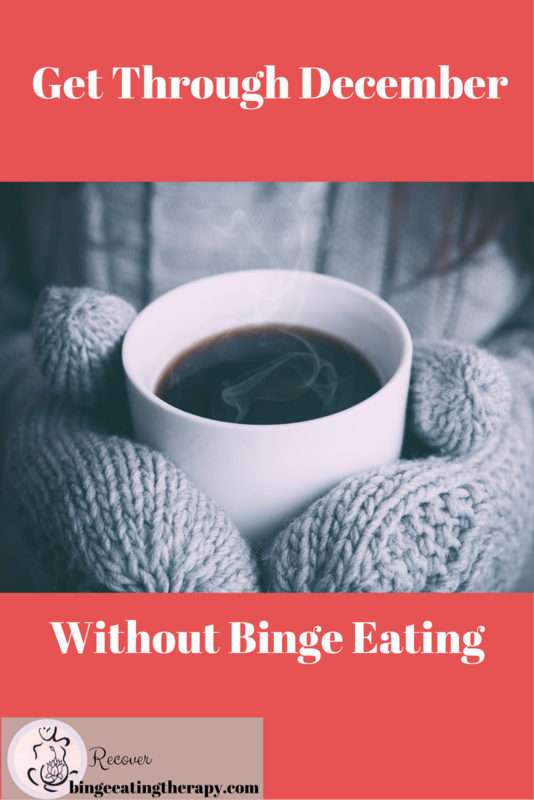 Did you know that often, in the Winter, people binge eat because they are cold? FACT. Eating raises your metabolism and warms you up. So other things to do when you have the urge to binge because you’re cold? Drink a cup of tea, take a hot bath or shower, do 30 jumping jacks, cuddle under a blanket, stretch your body, turn the heat up, put on extra sweaters… This is a physical reason for bingeing and one leftover from evolution. We no longer need to bulk up for Winter because we have coats and heat and houses to keep us warm. We don’t have to cuddle up under animal pelts in caves. Don’t blame yourself! It’s biology’s fault. This is an important one– because we are only limited by our own beliefs. When you challenge those beliefs, the world becomes completely open to you. I hope you had a fantastic weekend and a great Monday yesterday. My weekend was great. We have an annual Latke party. I’ve been doing this for 17 years! Since before I got married and had children even. It’s evolved over the years– it used to be a nighttime event with just adults on a weekend, but now we rent a bounce house every year, have a bunch of neighborhood teens in the backyard to watch the children, it’s a daytime event and the adults hang out in the house while the children play out back. I was surprised to find out that the kids look forward to it every year as much as the adults do! It’s so funny how things change and evolve and grow in different ways. Monday was of course a big tired day for me… but no rest! I took my 5 year old on his school’s annual holiday field trip to decorate the San Francisco Ferry. There are so many fun and annual traditional parties this time of year. And one of the big ones is The Cookie Exchange. It’s such a beautiful concept, people making the recipes from their ancestors past and then sharing them together. But of course when food is not easy for you, a cookie exchange isn’t a fun time to socialize, it’s an anxiety provoking situation filled with stress and anguish. It’s also a time where people either wind up bingeing and continuing the binge or restricting then coming home and bingeing because they were white knuckling so tightly all day or worse, they skip it, skip seeing all their friends, relatives, loved ones because the food angst is just too high. PERMISSION and INTENTION — when you give yourself permission, it makes the self-punishing, paradoxical black and white thinking go away. When that goes away, you have a big component that creates binge eating disappear. Intention insures that you have agency and can make decisions about what you want rather than letting the compulsion lead you into a place that you don’t want to be. I believe that this quote is so relevant to ED recovery because of how we tend to look at our bodies. We often say “I’ll be better when…. I’ll do this thing when… I’ll have a boyfriend/girlfriend when… I’ll exercise when… I’ll get a new job when… I lose all the weight… I am toned… I have a perfect body… My BMI is normal….” or whatever story it is that you tell yourself that implies that you’re not beautiful right now. Your beauty and perfection is right in front of you. Every fold, every curve, every dimple, every scar, every crease, every wrinkle, every roll, every grey hair, every deep line… all perfect and where it should be. Find the beauty that is right in front of you. Instead of looking in the mirror to search for what’s wrong, look in the mirror and see if you can find the beauty in the mundane or even in the supposedly imperfect or flawed. Find your beauty in your pimples or cellulite or dry skin or wrinkles or whatever it is that is perceived as a flaw and just look at it as piece of art or an objective state. Notice that beauty is all over you and everywhere. Need extra support? This is a great time to join the 5 Week Program. Right now and through the end of the month, I will be doing doing extra Facebook Lives as sort of support and group therapy and teaming up with buddies so that people can text each other through the holidays for extra extra support. Right now, for the month of December $497 when you pay in full. Get in now- and you will be part of this forever without ever having to pay another cent, even as more content, interviews and information are added. Join today and it’s yours forever. This is a lifetime program and monthly payment plans are available to make it easily affordable. Those of us who deal with binge eating behavior can often hide when we feel like we’re not doing well. We think we’re supposed to be okay and perfect all the time. Ironically though, eating disorders THRIVE in isolation. So if you’re struggling, please don’t do it alone. We are better together and we are stronger together. When you sit in your ED alone, it’s difficult to find recovery because it’s just you and ED. But when you have support, when other people know what you are going through, the part of the eating disorder that gets bigger and stronger when it is left alone to grow, that part is pushed out of the way. YOU ARE NOT ALONE! And you’re not the only one. If you are feeling lonely, depressed, anxious, or like you can’t do this, please reach out for support. Go Back to Day 3!